With its dedication in December 2015, the $1 billion Claude “Bud” Lewis Carlsbad Desalination Plant opened a spigot to the Pacific Ocean, creating a new, drought-proof source of drinking water for 3.1 million people in San Diego County, CA. As the largest ocean desalination plant in the nation and Western Hemisphere, the Carlsbad Plant is considered the future of water desalination in the U.S. by its proponents. According to an article in The San Diego Union-Tribune, the plant represents the “mainstreaming” of seawater desalination in California. “About 15 other desalination projects have been proposed for the state’s coastline, from the San Francisco Bay Area to Southern California,” the Union-Tribune article observed. Located adjacent to the NRG Energy’s Encina Power Station in Carlsbad, the desalination plant uses the same water intake system used to draw cooling water from the ocean into the power plant. After the water is filtered for sediments, it is pumped through plastic-coated reverse osmosis membranes that remove more than 99 percent of the salt and other minerals. By mixing the discharge water with cooling water from the Encina power plant, the discharge water will be only about 20 percent saltier than the ocean, according to The Bee. Desalinated water is fluoridated and chlorinated in preparation for delivery to the San Diego County Water Authority, which has a 30-year Water Purchase Agreement with the plant’s developer and owner, Poseidon Water. 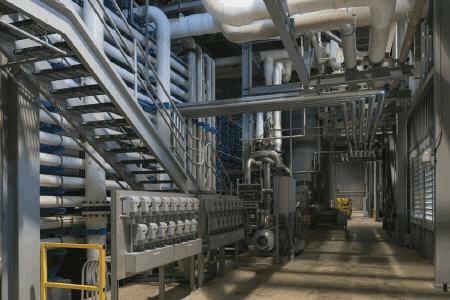 A private company, Poseidon Water specializes in developing reverse osmosis seawater desalination plants. Coating consultant Denis Amyot, NACE Level 1, of TPC Consultants, Inc., recalled his early involvement with the project more than 10 years ago. Among Amyot’s recommendations were coating systems for structural steel, miscellaneous ferrous metals, exterior surfaces of valves and piping, exterior polyvinyl chloride (PVC) and chlorinated polyvinyl chloride (CPVC) piping, and cast-in-place concrete infrastructure. The selection of coatings for interior and exterior structural steel, pipes, and valves included Series V69 Hi-Build Epoxoline II, an advanced generation polyamidoamine epoxy, Series 1075, and 1095 Endura-Shield, an aliphatic acrylic polyurethane coating. Coatings for non-submerged, exterior PVC and CPVC piping were Series 115 Uni-Bond DF, a hydrophobic acrylic and Series 1029 Enduratone, a low-VOC, High Dispersion Pure (HDP) acrylic polymer. The plant’s concrete surfaces were patched and filled with Series 218 MotarClad, an epoxy-modified cementitious mortar, to eliminate voids and bugholes, prior to being topcoated with high-performance epoxies or polyurethanes. Epoxy coatings for the plant’s concrete channels included Series 22 Epoxoline, a 100 percent solids polyamine epoxy, and Series V140 Pota-Pox Plus, a polyamidoamine epoxy. Concrete secondary containment structures used Series 239SC ChemBloc, a novolac polyamine epoxy, and Series 282 Tneme-Glaze. The secondary containment system for fluorosilicic acid tanks used multiple coats of 252SC ChemBloc, a novolac vinyl ester mat-reinforced mortar system. Series 406 Elasto-Shield, a fast-setting polyurethane lining, was part of the coating system for concrete in drinking water environments, while Series 290 CRU, an extremely hard urethane coating, provided additional protection against abrasion and impact for concrete secondary containment areas. Approximately 16,000 desalination plants exist worldwide in 150 countries, according to the Global Water Intelligence and IDA Worldwide Desalting Plant Inventory.